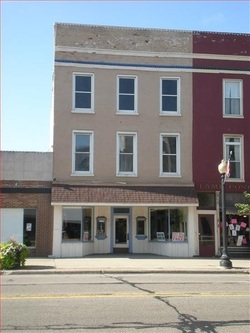 We opened in this new location of 19 West Chicago Street, Coldwater, MI in November of 2012, but it took years of searching and praying before this historical gem literally fell into our laps. It all started when our daughter Rachel brought it to our attention that the old t-Shirt Alley building was for sale. Having ben in the building years before, I told her that I didn't think it was right for us. After she asked two more times, I agreed to call the realtor for the particulars. The price was too high. Two weeks later while Tim and I were having lunch at Jeanie's Diner, Ken Keeton walked up to us and asked if we were going to look at that building or not. I smiled and told him that there wasn't much sense in wasting anybody's time as we couldn't afford the asking price. He returned my smile and suggested that we could take a look and if we liked what we saw, we could make an offer. A few days later we were inside for the first time trying to imagine if it could be all that we needed it to be. It had stood empty for a year and a half. There was no power, no heat so with flashlights in hand, we explored. There was a lot of work to be done inside and out and a leaky roof to repair. All in all, we were afraid that we couldn't possibly afford it all. We told Ken our fears and he reminded us that it doesn't hurt to make an offer. We had prayed all along but suddenly it became very serious. To make matters worse, a new interested party was bidding against us and the bank decided that on the next Monday the highest bid won. We had thrown numbers around, talked to family members and I had determined that whatever we could offer wouldn't be enough. The Sunday before the big day, we were in church and Tim prayed for guidance. Immediately, a number popped into his head. On our way home, he told me what the Lord had shown him. I didn't know what to think. I knew we would never get it for that price but we faithfully followed His leading and submitted our bid. Within an hour, Ken called and told me it was ours! Thank you, Lord!